All transactions are safe and secure with a reliable history in online purchasing behind each of our associates. 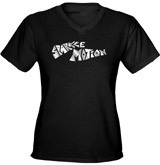 Buy the Sparkle Motion Donnie Darko t-shirts to own Donnie Darko clothing and merchandise. This great quote from the movie is now part of a great t-shirt. "Sometimes I doubt your commitment to Sparkle Motion." The custom made tee is white with a colorful sparkle motion logo, which has been enlarged in the box at the corner of the T image to the left. Click through to see an even larger image of this movie tee, which is perfect to wear underneath your Donnie Darko costume. In addition to the Sparkle Motion Donnie Darko tees above, browse the Donnie Darko Clothing Gallery for more apparel like men's and women's clothes, kids shirts or hoodies.